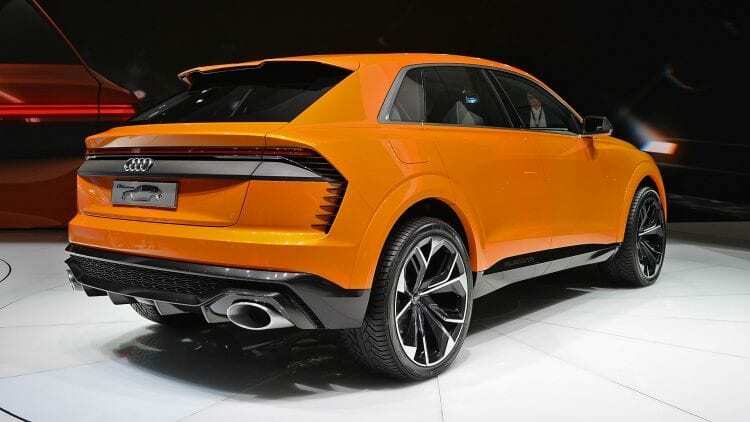 2017 Audi Q8 Sport Concept – Already! When a rumor started to spread that Audi is preparing new SUV flagship model, a couple of things was not clear at the time. Some rumors were suggesting that future rival of Range Rover and Mercedes GLS is under preparation, while others were suggesting a sportier approach, in the form of coupe SUV intended to rival BMW X6 and Mercedes GLE Coupe. Then everything became clear in January this year during Detroit Auto Show when Q8 Concept debuted. Obviously sportier and sleeker version of Q7 poised at Beemer’s and Merc’s slopping SUV roofs, and we hardly had time to get to know it and already new one is in front of us. Geneva is currently hosting 2017 Audi Q8 Sport Concept, what is a future spicy version of Q8, to be named, as expected SQ8. So, this is the meaner version of Q8 Concept and to justify hot moniker it has dimmed headlights, black honeycomb grille, black grille surround and accents at the front, black mirrors, black side skirts, black and more aggressive rear diffuser with visible pipes, and black gills below tail lights. So, lots of black here emphasizing sportier nature and you will immediately see what their goal was with this. Q8 is set on Q7 platform obviously, as much as Bentley Bentayga is, while it will be shorter by 1.1 inches. Still, the length of 197,6 inches is obviously more than BMW X6’s 192.1 inches or Merc GLE Coupe’s 192.9 inches, so it continues to stay huge. Let’s just note that it is bigger by almost an inch from Range Rover which occupies one class above. We are talking here about future SQ8, so this part must be special at least as much as SQ7 is at the moment, and it is, believe us. The biggest thing with SQ7 found its way here, and we are referring to the 48-volt electric compressor which is always at work. You see, SQ7 has twin-turbocharged diesel V8 and every turbocharger needs air to start spinning, while it gets it when you press the pedal. So, you have to push the pedal first, let him get its air, and he will return you a favor with plenty of boost. But that takes time and that time is hateful turbo lag. Or you could have all time working compressor pumping air constantly, and let’s say that turbocharger doesn’t have to wait for your push of the pedal anymore to start its magic. Don’t worry Q8 Sport Concept has some of its own perks to brag about, besides borrowed one. It has twin-turbocharged 3.0-liter V6 petrol engine delivering 450 hp and 391 lb-ft of torque. And that is not all. To keep it company we have an electric motor rated at 27 hp and 125 lb-ft. Combine that together, and we have, much more pleasing 476 hp and 516 lb-ft of torque. That should prove enough for reaching 60 mph in 4.7 seconds and a top speed of 171 mph. 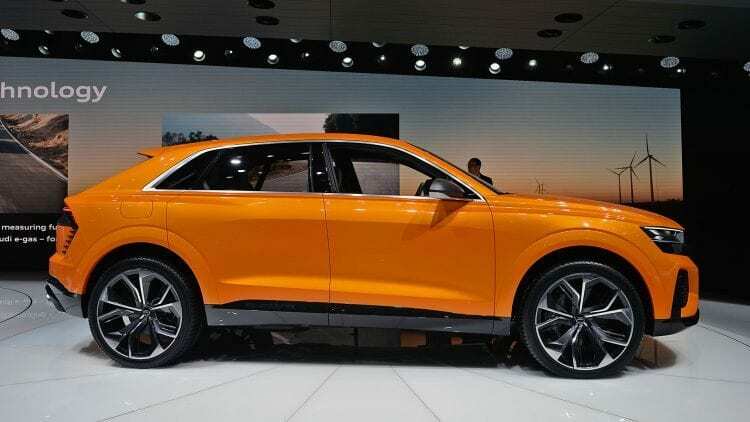 As for energy storage, 2017 Audi Q8 Sport Concept has rather small 0.9 kWh battery, as this is not a plug-in hybrid as Q8 Concept was, but we do have regenerative braking and total range of 746 miles. Rumor says that Q8 might debut as production version during this year and we bet you can’t wait for that.